On March 1, 2015, I left my New York City apartment to become a nomad. I put all of my stuff in storage, grabbed two carry-on bags, and set out to see the country. Over the next 18 months, I traveled an estimated 159,023 miles (that’s 255,922 kilometers), or roughly 6 trips around the globe, equivalent to one circumnavigation every 3 months. I went to all 50 states, took over 2,000 pictures, and ate millions of calories. And I collected stories. Stories of the experience of a lifetime, of a journey to all 50 of these United States. Stories that told the beauty of this country, the kindness of its people, the deliciousness of its food, and the awfulness of the state of Michigan. Stories of an incredible period in my life. 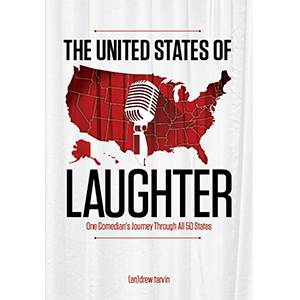 Pick up the book on Amazon in Print, Kindle, and Audiobook: The United States of Laughter. Interested in purchasing this book in bulk?